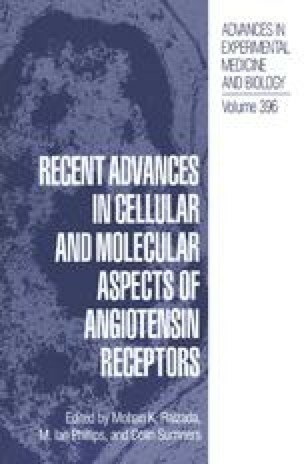 AT1 preceptors, its mRNA and cellular actions of angiotensin II (Ang II) have been compared between neuronal cultures of Wistar Kyoto (WKY) and stroke-prone spontaneously hypertensive (SP-SH) rat brains. Bmax for AT1-receptor binding is 2-fold higher and is associated with a parallel increase in the levels of AT1 preceptor mRNA in SP-SH rat brain neurons compared with WKY rat brain neurons. Ang II causes stimulation of both c-fos and norepinephrine transporter (NET) mRNAs in both strains of neurons and this stimulation is also 2–3-fold higher in SP-SH rat brain neurons compared with WKY rat brain neurons. In contrast, Ang II stimulation of PAI-1 mRNA in SP-SH neurons is only 50% that of in WKY rat brain neurons suggesting that SP-SH neurons express a decrease in AT1-receptor coupling with PAI-1 response. These observations demonstrate that SP-SH neurons express AT1-receptor-functions similar to those described for SHR neurons.